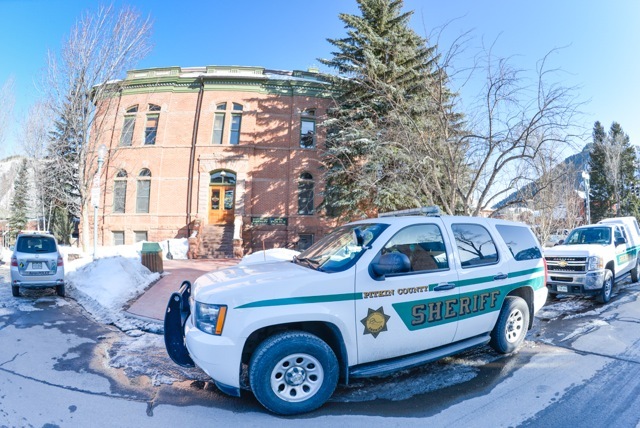 With officials struggling to make room around the courthouse for some 28 patrol cars belonging to Aspen cops and Pitkin County sheriff’s deputies, Sheriff Joe DiSalvo had a suggestion Tuesday — move the Aspen police force out of the county courthouse. City planners are working on a new design for Galena Plaza — the open space between the library and the jail — and want to improve pedestrian connections between downtown and the plaza. That means finding a new place to park some of the 10 to 15 cop cars and sheriff’s vehicles that are typically parked on Galena Street on the west side of the courthouse. There are only six legal spaces on that short section of Galena Street. The way the cars are normally parked around the small traffic circle could make it difficult for fire engines to get through, according to county officials. DiSalvo says there is a legitimate need for 28 cop cars and sheriff’s vehicles to be parked within 150 feet of the courthouse to make it easier for officers and deputies to respond to urgent service calls. The county’s facilities manager, Jodi Smith, showed DiSalvo and the Pitkin County commissioners two parking alternatives Tuesday. Both included parking up to eight law-enforcement vehicles in front of the courthouse along Main Street after a curb-cut is made to make room. Pulling the curb closer to the courthouse would likely mean that a row of crabapple trees would have to be removed. “This looks like a police state in front of our courthouse, and quite frankly, I don’t like it,” said Commissioner Rob Ittner. Ittner questioned whether 28 cars needed to be poised and ready for officers to quickly reach and where the 150-foot limit was coming from. DiSalvo said that, yes, 28 spaces were needed for patrol cars between the city and the county forces, and he came up with the 150-foot rule. He said officers have enough to think about when responding to a call without running a block or two for their cars. He also said he was proud of how sheriff department vehicles looked, but conceded that he was not a big fan of parking in front of the courthouse either. There are limited options, however, he said. Commissioner George Newman asked whether the city had looked at using the parking lot on the city-owned Zupancis property — behind the city’s traffic-ticket office — to park patrol cars. “We’re not intending to go there,” Smith said, noting the property may be sold by the city and they were looking for a long-term solution. The “cop shop” in the courthouse is in flux, as the sheriff’s administrative offices have recently been moved out of the basement to what used to be the district attorney’s office. The administrative offices for the police department remain in the basement and both cops and sheriff’s deputies are housed in a patrol room at the east end of the basement. When asked, DiSalvo said he had considered whether it made sense to move the sheriff’s office to the building along the river where the Aspen Art Museum is today, but he said it was too far from the county-run jail. “We transport prisoners three or four times a day and it’s really not pragmatic for us to be there,” he said. No one from the Aspen Police Department was at the meeting.